Finally! A fun and dramatic game. Clint Frazier was the man of the hour with three hits. The first hit broke up a no-hitter by Milwaukee starter Brent Suter in the fifth inning. The second hit brought the Yankees within a run when the ball landed on top of the Stub Hub sign in left for a triple to score two runs. 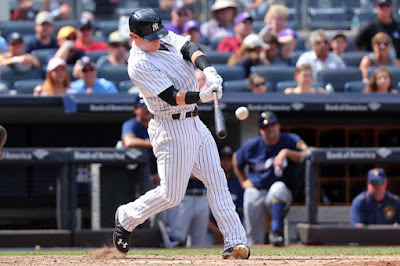 The third hit was a game-winning walk-off home run to left as the Yankees overcame the Brewers on Saturday afternoon. The first inning didn’t get started on the right foot. After Eric Thames looped a double to right field, Travis Shaw was awarded first base in a controversial “hit by pitch”. 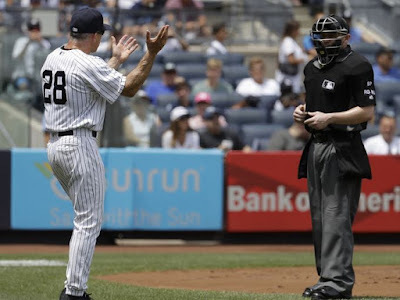 The umpire didn’t react until Shaw said something which caused the ump to send Shaw to first base, drawing the ire of Manager Joe Girardi. Girardi could be overheard saying “He called it, you didn’t call it”. The TV replays, to me, were inconclusive. If the ball hit Shaw, it was fabric only but even then, the jersey didn’t move as the ball passed through to the catcher’s mitt. Domingo Santana followed with a fly ball just over the right field wall which gave the Brewers an early 3-0 lead. For the Brewers, it would be the end of their offensive show for the day. 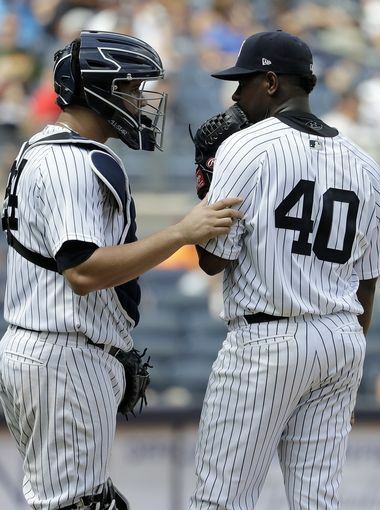 Luis Severino made the necessary adjustments (I hope you were watching, Michael Pineda!) and shut the Brewers down for the next six innings. By the time he departed, he had pitched 7 innings, allowing 6 hits and the 3 runs allowed via the first inning home run. He walked two, both in the 6th inning, while striking out 10. It was a no-decision for him but the Yankees do not win this game without Severino’s performance. The Yankees had a scoring opportunity in the 2nd inning when Didi Gregorius lofted a fly ball to center. Four Brewers converged at the same time and the ball fell between them for an error on Brewers shortstop Orlando Arcia. But the Yankees were subsequently caught with awful base-running. Chase Headley hit a come-backer to the pitcher and the Brewers had Didi caught between second and third. Didi didn’t try to extend the rundown and the Brewers were able to tag Didi out and nail Headley off first base for the double play. If Didi had tried to evade the tag, it would have given Headley the time to get back to first. 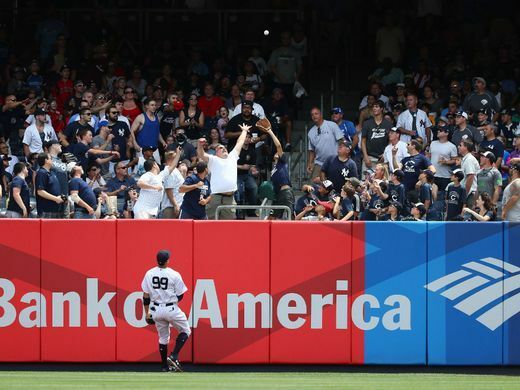 The Yankee bats were silent until the fifth inning when Clint Frazier finally collected the Yankees’ first hit off Brent Suter, a two-out single to right. The Yankees weren’t able to do anything with it but it was a start. After Luis Severino struck out Eric Thames with a runner in scoring position to end the top of the 7th, the Yankees finally got some runs on the board. Chase Headley hit a one-out ground rule double to center. Jacoby Ellsbury singled to move Headley to third. A failed pick-off attempt at first allowed Headley to score while Ellsbury moved to third. Clint Frazier hit a fly ball that momentarily looked to be a home run but it bounced off the lower part of the left field wall for a triple which scored Ellsbury. The Yankees had closed the gap to 3-2. Ji-Man Choi, pinch hitting for Austin Romine, and Ronald Torreyes were unable to bring Frazier home. Onto the 8th inning and it was time for the Yankees bullpen which has been an Achilles Heel in recent days. Dellin Betances took the mound in relief of Severino. 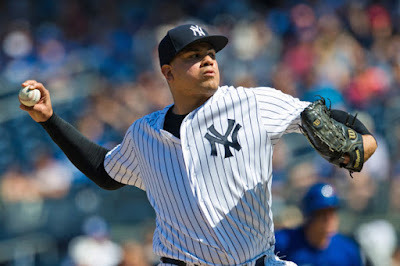 It was a ‘hold your breath’ moment until Betances proved to be the All-Star that he is, allowing everyone to exhale. He induced Ryan Braun to ground out and then struck out both Travis Shaw and Domingo Santana. Whew...Welcome back, Dellin! The Yankees were unable to generate any offense in the bottom of the 8th. Moving to the top of the 9th, Aroldis Chapman replaced Betances. Chapman has struggled with his command in recent games, but not yesterday. Three strikeouts later, it was off the bottom of the 9th with the Yankees still trailing by one run. The Brewers brought in their strong closer, Corey Knebel, who has been a very pleasant surprise for the Brewers this year. Knebel has struck out 72 batters in 41 innings while saving 13 games for Milwaukee. He came into the game having only allowed 5 runs in 41 games. The only knock against him is a tendency to walk too many batters. The weakness appeared right away as Didi Gregorius walked to open the inning on four straight balls. Chase Headley went down swinging but Jacoby Ellsbury, like Didi, also walked on four straight balls as Knebel continued to struggle with his control. So, the Yankees had runners at first and second with one-out when Red Thunder strolled to the plate. After a ball in the dirt, Knebel grooved a 97 mph four-seam fastball down the middle. 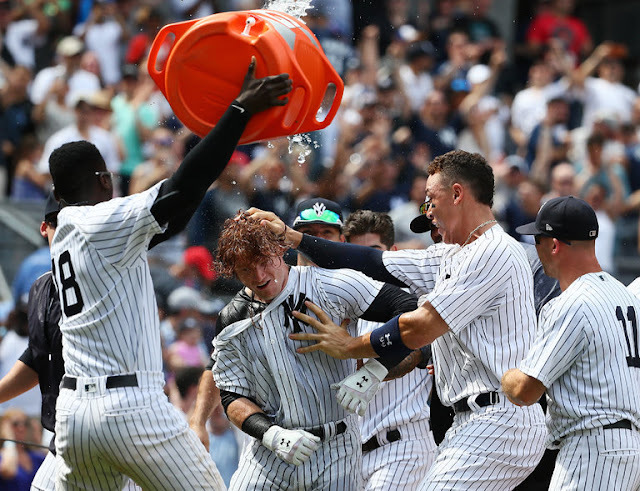 With his blazing bat speed, Frazier quickly blasted a shot into the left field stands for the game-winning three-run home run as the Yankees won the game, 5-3. 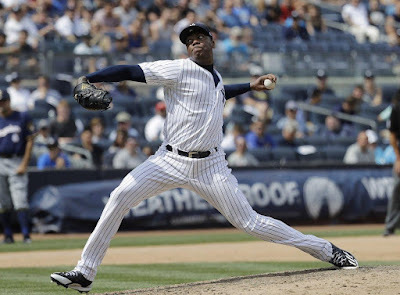 Aroldis Chapman (2-0) was the winner. The Yankees (45-40) were able to pick up a game on the Boston Red Sox so they are 3.5 games out in the AL East. The Tampa Bay Rays remain a game behind the Yankees, courtesy of their 1-0 victory over the Red Sox. The Yankees conclude the first half today when Masahiro Tanaka (7-7, 5.25 ERA) takes the mound against Milwaukee’s Jimmy Nelson (7-4, 3.20 ERA). Hopefully, yesterday’s dramatic win and stellar bullpen work provide the momentum for a new surge by the home team. The rumor mill is certainly heating up. Within the last 24 hours, it has been reported the Yankees have heavy interest in first baseman Justin Bour of the Miami Marlins and reliever Brad Hand of the San Diego Padres. I am always a little suspect of the trade rumors you openly hear about as GM Brian Cashman generally plays his cards close to the vest. The more likely trades are the ones that you never hear about in advance. I would love to have Hand in the bullpen but the issue is cost. I’d hate to lose Chance Adams or Miguel Andujar (a couple of the names that have been mentioned). There would be a bit of irony with the Marlins (which includes Manager Don Mattingly) sending Bour to New York to be the Yankees first baseman. 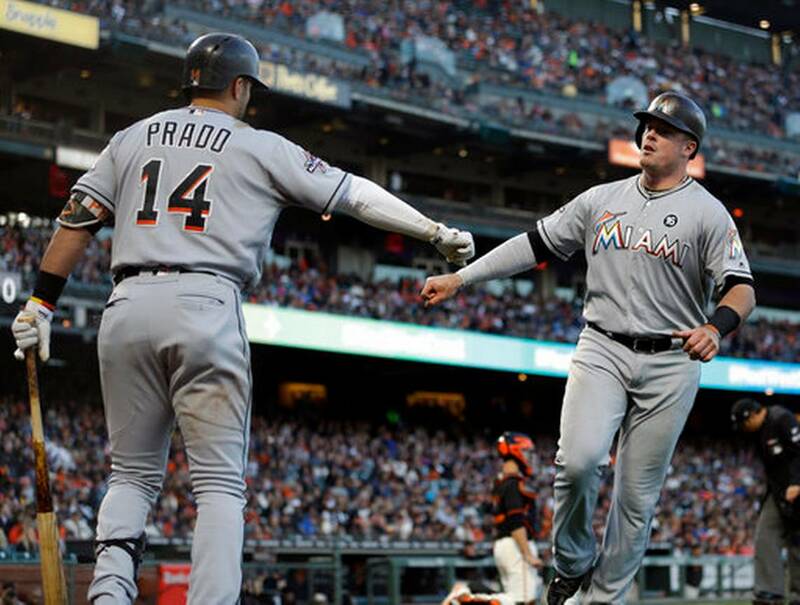 Bour hit his 20th homer of the year yesterday in Miami’s 5-4 victory over the San Francisco Giants. There’s no doubt he’d be an upgrade over Ji-Man Choi. The YES Network’s Michael Kay mentioned an interesting stat during the telecast. Yesterday was the 17-year anniversary of the Yankees’ double-header sweep over the New York Mets which featured games at both home parks. 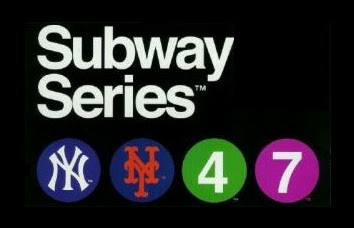 Dwight Gooden and Roger Clemens were the winning pitchers in the subway double-header. It’s hard to believe that it has been 17 years as I can clearly remember that day well. It was a preview of the memorable Fall Classic that would pit the two teams against each other. Matt Holliday was 2-for-4, both singles, with two runs scored in his rehab assignment for the Scranton/Wilkes-Barre RailRiders. The RailRiders won the game, 8-1, over the Lehigh Valley Iron Pigs. Jake Cave was 3-for-3 with 2 HR’s and 5 RBI’s. Miguel Andujar also chipped in a home run. Have a great Sunday! I am looking forward to more Red Thunder! But, please, no Tyler Clippard. Let’s Go Yankees!